Driving down Ridge Road in the dark, the glowing orbs caught my eye. A dog? A fox? Then, its gray, fluffy tail caught my eye along with its pointy nose. The coyote slunk across the road and meandered off through the snow. Scrounging for food, I’m guessing. Perhaps no wild animal elicits a range of emotions more than the coyote. Cursed by some for the devilish ways of going after livestock, admired by Native Americans for their wits and cunning, coyotes are an integral part of the wild kingdom here in Colorado. Though, chances are, no matter where you grew up, you probably saw coyotes. They are one of the most plentiful mammals in North America. 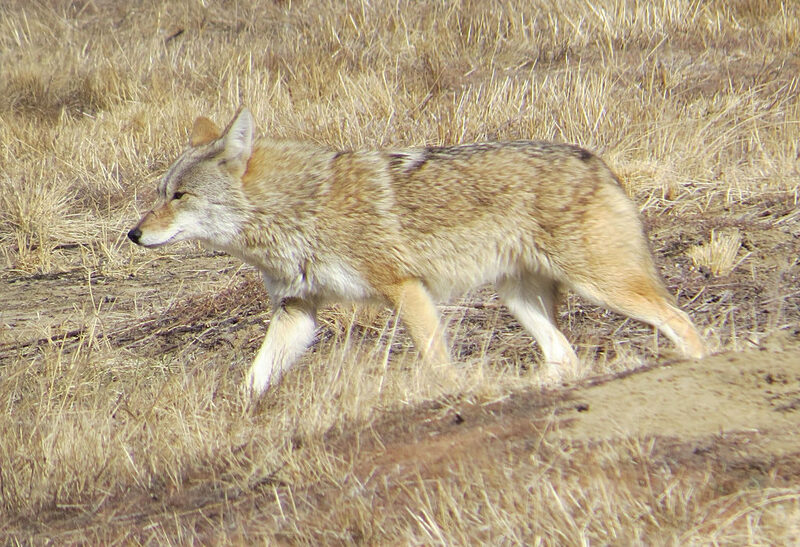 When I worked for Cape Cod National Seashore, I saw coyotes roaming the fields. Supposedly, they walked across the bridges to get there! You’ll spy coyotes year-round — they don’t hibernate or migrate, instead staying active even during the coldest and snowiest times of the year. Coyotes are classified as generalists, adapting to their environment, and hunting and eating just about anything. They are not picky, although they definitely prefer meat of some sort — but a small mouse, will do as well as a rabbit. With climate change threatening other creatures that make their home in the Rocky Mountains, coyotes continue to thrive. Because they are so adaptable to changing circumstances, they will make do, finding a place to bed down, their thick coats keeping them warm during these cold winter months. They are able to find food almost anywhere. Due to their flexible ways, you’re just as likely to see them downtown Boulder as in the forest near Nederland. . They would walk away looking deflated. Ironically, the gray wolf is one of the primary predators of a coyote. That and people. But those two threats have been removed for the most part. With no main predator, the population of coyotes has been steadily on the rise. Like any wild animal, some amount of caution needs to be taken. Coyotes can gather in packs, and be a real threat to domestic dogs. Also, like other wild animals, coyotes can carry rabies. Unfortunately, since coyotes have been frequenting more highly populated areas, they have lost their fear of humans. If confronted by a coyote, do not run. Stand you ground, make loud noises, and throw small rocks at him to drive him away. Being the great survivor they are, coyotes are here to stay for a long, long time. It’s our job to figure out a way to co-exist that works for us both.